Saturday, April 9, was the 100th day of Beebe Healthcare’s 100th year. To recognize this day and celebrate the future of Beebe, the 100th Anniversary Committee gave a gift basket to a new Beebe Baby. Locally, babies born at Beebe are known as Beebe Babies. Megan and Stephen Stearn of Millsboro welcomed baby Catherine during the morning of Sunday, April 10. The Stearns arrived at Beebe on Saturday, the 100th day, and Catherine was the baby born closest to that day. The gift basket included 100th Anniversary items, including a onesie, Tervis tumbler, first-aid kits, hat, and more. 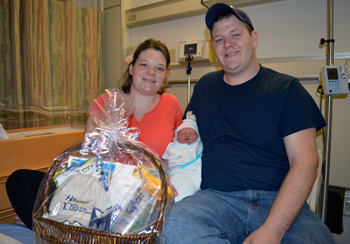 Shown are Megan and Stephen Stearn with new Beebe Baby Catherine and the gift basket. Beebe is celebrating its 100th Anniversary throughout 2016. For more information, to volunteer, or to register as a Beebe Baby, go to www.beebehealthcareevents.org.